Christine and Daniel Cooney of Heavenly Spirits will be sharing their knowledge, and experiences on the subject of Armagnac, the oldest distilled spirit in France. Heavenly Spirits specializes in the importation and distribution of award winning artisanal French spirits and has been named the leading importer of Armagnac in the US for the past three years. Lasting approximately two hours, participants will learn about Armagnac’s historic roots, regional associations, and production techniques. 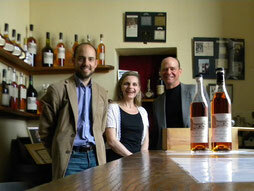 They will also experience a variety of Armagnac styles and tastes. Eight Armagnacs in all will be sampled during the seminar. Participants must be at least twenty-one years of age to attend. Tickets are $35. members, and $45. general admission and available on a first come, first served basis. Seating is limited.